I sat and I sat, thinking what should I name this little quilt. And nothing came to mind. So it’s Baby Quilt #1 (it will soon be clear why #1, hold on). It was inspired by this Low Volume Quilt from Red Pepper Quilts. Rita always had the most beautiful fabrics so this quilt doesn’t really compare to hers, but it was fun choosing the fabrics and easy to stitch it up. At 16×21 squares, 3×3 in square, it was quite a large quilt, and I had two little baby boys to make quilts for… AND I was running out of time – really, another quilt top before Christmas, with all the other things I need to do? It wasn’t going to happen. So, I thought, what if I make 2 quilts out of this one quilt top. The width became the length, I added a strip of linen – I thought it was a bit too skinny, and here is #1. Now, I made this decision before I got the new machine. Maybe, if I had this fabulous new machine a week ago, I would not have opted to split the quilt top. My thinking was – this is way too big and my machine will not like it. But with the new machine, with the walking foot I showed you in one of the previous posts, it was a breeze. Maybe I should tell you a little bit about this machine now, no? As I mentioned, it is a Janome Memory Craft 6300. It is not a new model, but I didn’t care. I had a budget of about $1000 dollars and I wanted a machine that would be bigger and have more throat (is that the word?) harp space for my quilts and that it would actually handle free motion quilting better than my previous machine that wasn’t really made for quilting. I wish I could tell you how much research I have done, and how I went around sewing centers and dealers and tried to work a few models (like everybody suggests) but I didn’t. I read this post by Stitched in Color, and then went searching online for prices and availability. I crossed from the list those that were outside of my budged and then I looked for reviews for those I considered. Soon I found that some machines you cannot order online (you gasp now, I know, order a machine online! what an idea!) you have to go directly to a dealer and most of those do not sell online. Most actually didn’t even have a website to show what they have in stock! In this day and age! I live in LA, and there are so many sewing centers and dealers around – however, LA is big which means everything is far (not necessarily distance, but it takes forever to get anywhere in this city) and did I really want/have time to go around shopping for a machine. No. (Sometimes it’s better if you have less options). So I chose Janome 6300 because Amazon had it on sale, also Overstock. Then I went and checked the reviews again, and I could not find a single bad thing about it. I was this close to just ordering through Overstock, because then I wouldn’t pay tax. But then I found that Jo Anne had it on sale too, even better than Overstock. So I didn’t know what to do. One more problem was that these websites did not list all the details, or that the details about what accessories were included were not matching. I called Jo Anne – they had no idea. What to do. Then I found through Amazon, that another seller was offering the same machine, plus a bonus pack of several presser feet and some other minor things. Now this seemed like the best deal (and their website claimed free shipping and not sales tax). But again, apart from the bonus pack, it wasn’t clear what basic accessories I am getting. So I called. And I ordered the machine. It came with all the standard thingies, plus the bonus pack, plus I got a $100 off because it turned out I had to pay tax after all (they are in CA too). I got the machine for $1099 plus I bought the extended warranty for 29.99. It turns out I can send the machine for repair/service for free – including shipping – during the warranty period. That was a good deal. I bought it online, but I got the service too. Now, I might have gotten a better deal if I called/drove around, but I might have not. And I really, really don’t have time or patience for that kind of stuff. This machine seems to have all I need – as I mentioned more harp space (9in), it is supposed to be very good at free motion quilting, it can actually change the foot pressure so it should be better with knits (my old machine cold not do this and it was stretching the fabric terribly), and other things I will talk about in later posts. * it actually doesn’t have to be hard to do a straight line of stitching. Wow. I could do it on my old machine but I had to work at it much harder. On this machine, I just lightly lead the fabric, it doesn’t squiggle so much. * the stitch length actually remains the same regardless of the speed of sewing or the thickness of (layers of) fabric. On my old machine I had to really pull the quilt through if I sewed across a thick seam. And the stitch length would always, always decrease. Not a problem for piecing, but it doesn’t look good while quilting. * no skipped stitches. To be fair my old machine didn’t skip so much, especially when sewing clothes, but it seemed to have problems when I was quilting a top made with (some) vintage sheets. It just didn’t like the crispier ones, with a tighter weave, I guess. It drove me crazy. It would be fine going over other fabric, but as soon as I sewed onto a vintage sheet piece, it would skip. I tried everything, including different needles, cleaning the machine, etc. But nothing worked. This machine went through everything equally. I really enjoyed quilting this quilt, and I even did not use the extension table that comes standard with this machine. It is pretty big, but I promised my son he would help me set it up. We did not have time last night, and this needed to be finished today. 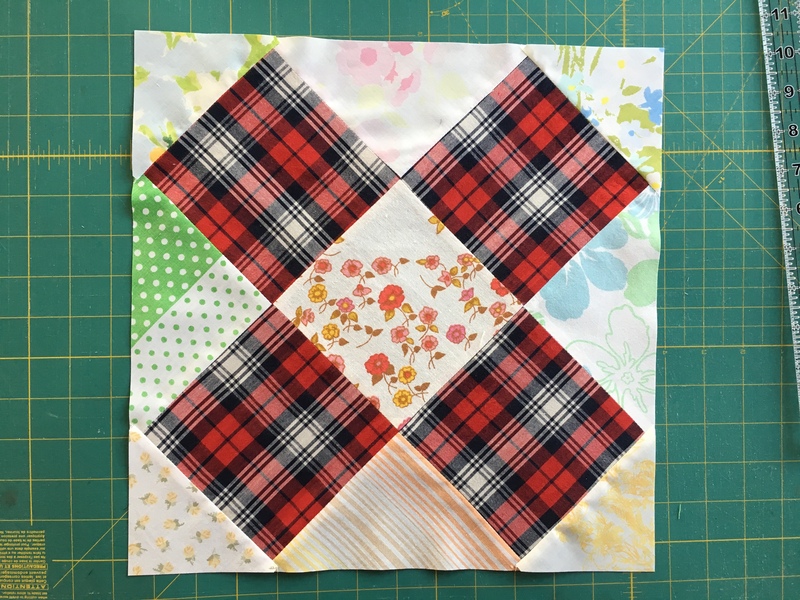 Also working with the walking foot – I never knew you could actually quilt without fabric puckering and folding over crossing a perpendicular quilting line. A regular foot pushes the top layer a bit, while a walking foot feeds at the same rate as the bottom layer. I can see using this machine for almost all sewing I do from now on, except when I use my serger. However, there is one problem wit it… the bottom part under the needle, where the bobbin goes, is wide. There is no way you could, for example, finish a sleeve or a cuff or anything narrow. My old machine had a part, actually a box holding accessories that could be removed and that made the lower part (there is probably a name for it?) narrow for exactly those situations. So, the old machine will go for service and then it will be stored. To be honest, my old machine was not made for quilting and it worked perfectly fine for sewing clothes (except knits). And it was reliable. In all the years I had it it never stopped, or broke down. Not even when I was on a deadline. Very reliable. This entry was posted in quilting, sewing and tagged Baby Quilt #1, sewing machine on December 6, 2012 by flekka.